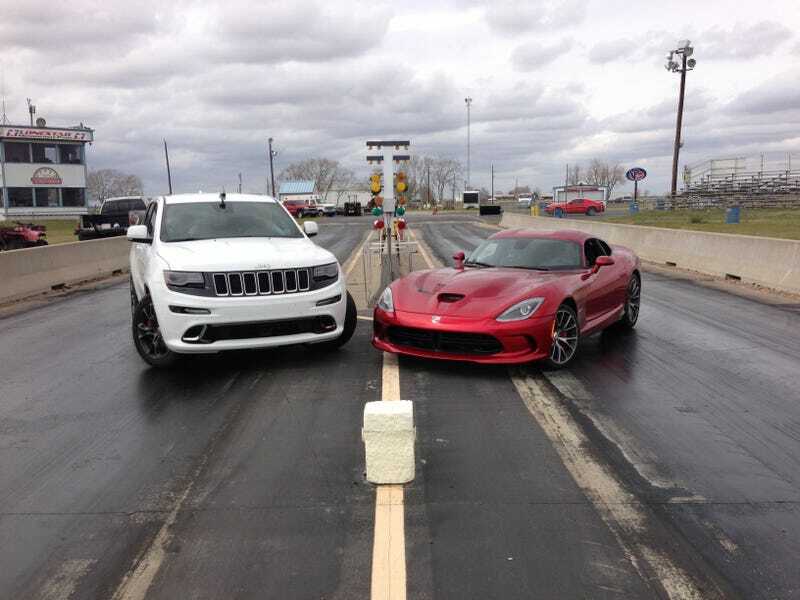 This just happened thanks to Hennessey&#39;s drag strip. This just happened thanks to Hennessey's drag strip. Yes, it was as fun as you think it was. If you think the new Viper is tame, you're so wrong. It was a handful on the first few runs and got pretty sideways. There was a pretty steady headwind and the Viper doesn't hookup in first. Or second. I eventually got it down to a 12.12 at 125 through the quarter and that's without launch control and with a track only sprayed for the first few hundred feet. The Jeep was behind at a 13.58 at 100 loaded up with a few hundred pounds of gear. That launch control rocks. Not shabby.